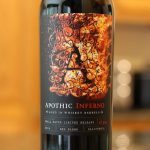 Apothic Inferno is a new Apothic wine that has come out as a small batch limited release. 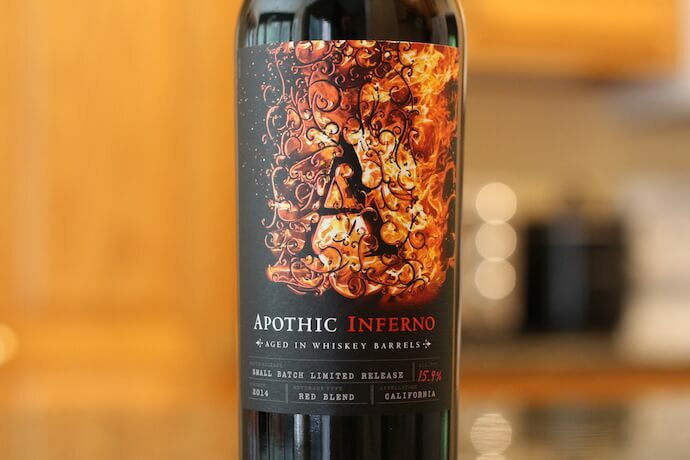 According to the bottle, Apothic Inferno is a red blend from California that has been aged in whiskey barrels for 60 days. A new blend emerges from the flame of a time-honored craft, creating a most unexpected and masterful encounter. I tasted the 2014 vintage of Apothic Inferno. 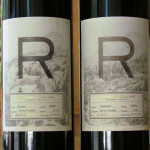 When poured, this wine exhibits a dark, cherry-red color. 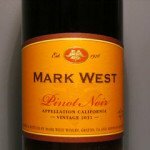 Having gotten used to their often dark wines, I was a but surprised that this wine does let a decent amount of light come through. The wine’s legs are slow to form, but once they start to drip they move down the glass pretty quick. Although I did notice that some seemed to just hang on the glass and never started their journey south. The wine’s aroma is not immediately noticeable upon pouring, although you do get a few subtle whiffs. Up close I seemed to notice a caramel candy cane meets spicy red fruits kind of aroma. Different and enjoyable, though maybe a little metallic. There’s definitely a good sting of alcohol in there. It takes over your senses a bit after the initial aroma is sensed. Apothic Inferno alcohol content 15.9% by volume, per the bottle. This is a fairly high alcohol content level for a red wine. I must start out by saying that this wine’s taste pushes the envelope of what you’d expect from a red wine’s flavor. You get a spicy mix of cinnamon, red and black fruits, and a definite maple bourbon note from the whiskey barrel aging. Apothic Inferno coats your mouth with a one-two punch of silk and spice, making it hard to quantify the texture. Tannins are more subdued than present. I didn’t note a specific spot on the palate where they settled. It’s definitely a long finishing wine, with the finish being carried by the flavors vs. the tannins. However, as I was doing so I was certainly cognizant of the fact that I was enjoying it. And, the aroma was getting nicer and nicer with less alcohol burn and more caramel on the nose as the wine had a chance to breathe in the big glass I use to taste-test. Much like Apothics of the past, it’s novel in flavor. But, having followed the brand so closely, I can see that they’re trying to balance uniqueness with staying power. I saw that in Apothic Crush, in that it wasn’t so unique that you would only want it once in awhile. I think they’re accomplishing the same thing with Apothic Inferno, but introducing the whiskey barrel aging in order to make it stand out amongst the cacophony of red blends out there these days. So, bottom line, I really enjoyed it and I would drink it again. Give it a go, but be prepared… it stands alone in its unique flavor. Given this wine’s spice and ability to stand on its own, I would pair this with honey glazed barbecued ribs. SPECIAL UPDATE 2019: While previously a limited release, Apothic Inferno appears to be a permanent addition to the Apothic wines family. Over the past several months I’ve been seeing it at most wine stores and local shops and it appears to be in full supply. How about you? Are you seeing this in your local area as a full time release? Let us know in the comments, below. 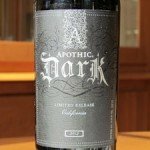 We also tried this wine recently, since we’ve been fans of the other wines in the Apothic family, particularly Apothic Dark. I do have to say that this is probably my least favorite, perhaps because I’m not really a whiskey fan. Both aroma & taste were decidedly “whiskey”, & frankly that’s not what I want to enjoy in a wine. We served it with a meal featuring Southwestern-style seasoned duck breasts, & luckily the meal flavors were strong enough to blend (or counteract) with the wine. I really can’t see it paired with anything other than strong-flavored foods. Frankly, not something I’ll be buying again. The other Apothic wines are much more enjoyable for us. But again, wine – like food – is a personal thing. Thanks for helping me keep Honest Wine Reviews honest, Bonnie. It will be interesting to see what comes back from everyone on this wine. I definitely agree with you on pairing it with strong flavored foods. It could easily overwhelm a lighter dish. I hardly ever look up wine reviews but after taking a few sips of this wine I had to see if I could figure out what is so different about it. Your review is spot on. I’m not sure I would purchase it again, but I can see why some might find it enjoyable. Do you happen to know what the blend consists of? I look forward to checking out some of your other reviews. Thanks. Glad you found my review helpful! I hope the others are helpful to you as well. 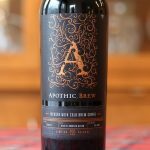 Apothic didn’t list what the blend consists of on the bottle or on their web site. So for now, a mystery. I will add that I found this wine did improve on day 2 and 3. It mellowed some of those in-your-face flavors. I agree, I found the same to be true. Looking forward to trying this wine, especially this Fall. Might be a good one to sip sitting around the bonfire after a hearty dinner. Thanks for featuring it! Thanks Miss Jonelle… You’re welcome! Thanks for contributing Michelle! Yep, some people are finding the whiskey taste hard to take. So, I love the Apothic line. I have been buying it for years. When I saw Inferno I immediately had to try it since I’m a fan of both wine and whiskey. Let me do a wine review….. Appearance and Aroma: No warnings of what is to come. Taste: If there are hints of anything I didn’t notice them over the smoke. Finish: Longggggggggg. I was doing the laundry an hour after I finished the bottle and had a strong finish of burnt bacon. Gross. Overall Opinion: I will never buy a bottle again. I love buying wine for around 10 bucks and finding good and bad about it. There’s nothing good here. I’ll still buy Apothic and Dark in quantity, and maybe it’s my own taste buds, but Inferno just doesn’t fly. If we see a 2017 vintage I’ll be surprised and worried that the whole vinery went down in flames with it. Thanks for the review and comments, Johnny! I’m a fan of the Crush, the initial release more than recent. The Dark is ok but haven’t tried the others. This one caught my eye and gave it a try. Paired with a Neoplitian style pizza of Italian sausage, pepperoni & portobello mushroom. Just because the food decision was made before the wine purchase. Immediate, spicy but velvety. The nose, carmel-butterscotch. Very interesting but, like you, kept drinking it to figure it out. Decision, I like the uniqueness and will buy more for the fall/winter evening “warming”. Thanks Sharyn, glad to know I’m not the only one who liked it. Hate to lead everyone astray. Nice pairing choice too… I like your taste in pizza! I have to say, especially after reading the other comments, that I loved the taste of the inferno! I don’t drink whiskey, but can enjoy the flavor of a sip. I buy the regular Apothic and have tried the Dark and the Crush, but the Inferno is my new fave. It definitely has a touch of the whiskey taste, and fires up your throat a bit, but I will be buying more of this. So, more for me since the rest of you don’t seem to like it!! OK… Someone else who liked it! Thanks for commenting J, it’s appreciated! Thanks for your detailed review! I can’t wait to try it ( I just bought a bottle :]). Now do we drink it at room temperature or slightly chilled? Hey Veronica, you’re very welcome! I had it at room temperature. I tend to taste a wine’s flavors better when it’s not chilled. But, that’s just me. A lot of people do like their reds slightly chilled. I enjoyed this wine. First sip…it made me think of craft beer that is made in the Fall. Just tastes like the Fall season. When I first poured it into the glass, it looked light. I thought uh-oh, I might be missing out on the rich flavors that I’m used to with Apothic. Wrong. I cautiously took a sip. Tasted caramel . Another sip…a bit of spice… kept sipping….curious about the tastes I was experiencing. Really enjoyed it. Flavours melded wonderfully. Was looking forward to the rest of the bottle tonight. But on reading reviews, I may let it sit a couple of days, to see if flavours mellow as I’ve read. Hey Eva, You are very descriptive in your writing… Nice! Thanks for sharing your experience with everyone. I’m sure many will benefit. I tend to drink genuine 10 or 20 Year Tawny Port (Taylor Fladgate) or the Apothic Red after aging it for 12-24 months in a cool, dark place. Found out how much the flavor develops with doing this when a bottle rolled under my bed and stayed there until I moved. However, I tried Inferno straight from the shelf and absolutely love it, but I feel aging it for a few months will really help it mellow and develop into an even better wine. Inferno does have a dominant flavor of whiskey – something I enjoy but that will be mixed in reception. Thanks for sharing your experience with everyone, Roland. It’s great that you allowed the Apothic Red to age. So many wines these days are being sold to drink right away. It’s nice to know that particular wine can improve with age. I’d be interested in hearing how Inferno ages, too. I had a friend of mine buy a few bottles of Inferno. I must say…imagine yourself, sitting in the woods in the mountains, on a cool fall day next to a crackling campfire. Imagine the smell of the burning wood, and smell of the pleasant smoke……so pleasing. 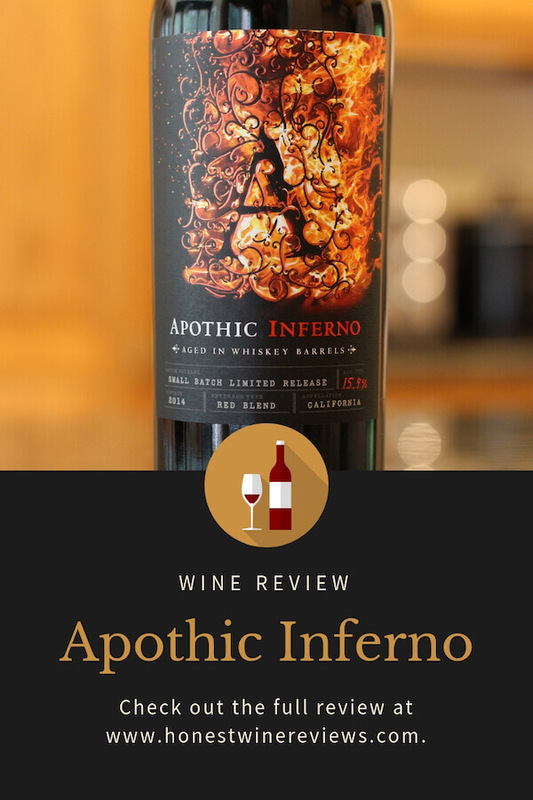 Now imagine, that’s what you experience, but in your mouth, when you drink Apothic Inferno, it’s like a pleasing, sweet smelling campfire in your mouth, if you can taste a campfire, this is what this wine brings to your palate. I gotta say, this is my favorite red wine ever. 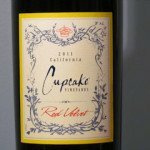 If you enjoy the traditional flavor of a red, or merlot, this is NOT for you! If you like the added flavor of aged oak in your wine, with a hint of whiskey/bourbon, which is very enjoyable, by all means, you got to try this. What a great review and analogy, Roger… I like it! If you love bourbon and red wine then this is a perfect blend for you. I found this today at our local grocery and bought two bottles. I am a fan of the other Apothic blends and found this to be my favorite. The flavor is like previously described as being like autumn and Halloween. I drank the wine with some bacon cheeses and couldn’t get enough. I usually drink a whole bottle but found just 3/4 of this bottle to be satisfying because of the high alcohol content. Even now, as I sit a half hour after drinking it, I find that I am still savoring the taste. The flavor remains on your palate and continues to satisfy long after consumption. I just have to try this with some grilled sirloin hot off the grill. I will enjoy the second bottle in that manner. I am so enthralled with this wine that I intend on going back to the grocery tomorrow and picking up no less than six bottles of this. I will age a couple of bottled 6 months plus and see how that goes. Perhaps the remaining 1/4 bottle from tonight will improve even more by tomorrow. I drank mine after chilling in the frig for 30 minutes. Thanks for commenting Robert! Always great to find a wine you really like. It’s definitely a flavorful wine with a long finish. Cheers! Sorry about sending the message to you & bothering you, yikes. After writing it, I realized I wasn’t writing to Apothic, but too late as I’d already sent it. I wonder if I was looking at a fake Apothic bottle at the grocery store here in CA, named “Smart and Final”, or else I got the name wrong. But it had an actual Middle Ages type photo on the label. It was really cool, but oh well….. Thanks for your reply. I’ll keep a lookout for “Smart and Final” too. I LOVE the Apothic Inferno! The other Apothic varieties are good, but too subtle for me. I haven’t found another inexpensive bottle I like as much as Inferno, which is a shame, bc it seems to be nearly impossible to find right now. I’m hearing they’ll re-release it in July. Thanks for commenting and sharing what you heard about a re-release! Apothic Inferno dried up to quick. I was able to get 8 bottles but they went quickly. 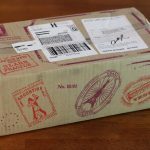 I was approached by a fellow wine drinker that purchased several cases and was offered a sealed case for $360. Is anyone still holding on to a few that would be available at a cheaper price or is this the going price? I saw an ad on Kijiji where the person was asking $60.00/bottle. Good luck with that. I think if you can get it for $30.00/bottle, go for it. Personally, there are a lot of good wines out there for way less than that even. Your choice, I will wait for the next release and enjoy some other wines out there. Its back . Liquor Depot has it …. Great love it! My friend bought a case. Well these comments are very interesting. I have enjoyed Apothic Brand wines for a couple of years now. I especially enjoy Apothic Crush. While at my package store this week I saw a display for Apothic Inferno. I have never seen or heard of this blend before. I purchased a bottle for when it gets a bit more fall like here in New England. But funny enough, the vintage for the bottle I purchased is 2015! I hope it was stored correctly and that it will taste as good as all of the people commenting here say it does. Also, I found this site as I was looking for reviews for this wine. Cheers. Hey Jenny so glad you found my site! Thanks for commenting. The 2015 vintage came out in September 2017. It’s their second release and it’s also a limited release, much like the 2014 vintage released in 2016. I’ve tried the 2015 and found it to be consistant with the 2014. I just picked up a bottle at Meijer for $9.99 – can’t wait to try it this weekend! Is this wine Gluten Free? I have celiac and I am worried about it being aged in whisky barrels. Anyone with Celiac drink this?Any reaction? Great question Kelly, you might also try contacting Apothic directly. My honest review is that this stuff is terrible. The original was terrible, and the latest abominations even moreso. In any case, since their wines are infused with oodles of residual sugar*, I doubt that any marketing concept is too off the wall for them to try to sell. Soon, I expect that Apothic will bring to market coffee, jalepeno, or malt liquor infused wines. Another possibility is that they’ll try regionally inspired versions like moon pie or fried bologna flavors. * Yes, for those of you who claim to not like “sweet” wine, I’ve got news for you… the Apothic wines typically have anywhere from 5 to 7 times the amount of unfermented residual sugar that a truly dry wine has. So next time someone offers a German Riesling, you should consider trying it. If it’s from a good producer, it’ll likely be far better than anything from Apothic (or Barefoot, or Yellowtail, etc). Thanks for taking the time to comment, Jim. Honest reviews are always welcome! I love, love, love this wine. I am a brandy drinker so I enjoyed the spice and the warmth of the wine. I agree with a previous reviewer that there is a hint of butterscotch. I paired it with cooking dinner . I will purchase again. I’m pretty sure this is a you “like it or you hate it” kind of wine! Thanks for commenting and sharing your thoughts, Deb… Much appreciated! This is the best wine I’ve experienced! My wife and I love it and are now down to only a couple bottles left. Bought 2 cases and have enjoyed it weekly for the past 6 months. Waiting to hear of the next release. According to their website, it’s back for a limited time. However, it’s been out of stock at the places I’ve checked. So, time to keep an eye out for it! I have to say up front that I’m a bourbon fan, I also like very hearty and rich red wines. My neighbor, who is also a bourbon fan shared a bottle with me. I was very surprised by it. When he told me what he was going to be sharing, I had no idea what to expect never having tasted anything as he described. It was a flavor explosion for me. The smokey barrel flavor was just so unique I couldn’t stop sipping. I would sip and try to take in all the flavors to see if I could determine what I was actually tasting. It’s a very complex blend of flavors. I can definitely see someone not being a repeat customer since the flavors are so unique. I, for one, will be a repeat and buy it whenever I can find it. Its uniqueness is its greatness. Sitting around the firepit on a cool autumn evening with a glass of this unique creature is a perfect blend! Thanks for your comment Todd! Reading it took me back to my own experience with this wine, sipping it over and over again and trying to process it all. Great review and thanks again… Cheers! I’m very much into Whiskey and Bourbon, not so much into wines though. I also like to enjoy a cigar when I embibe. However, when only wine is present I tend to enjoy a Pinot Noir, though I don’t purposely stock other wines and outside of the Inferno they’re usually gifted to me for some reason. Long ago it seems, cruising the isles at a local supermarket, it was the label that jumped out at me, because… fire! =) Once I read about it being finished in Whiskey barrels I was sold! I’ve been a fan ever since the 2015 edition came out. I spend more time than I probably should searching for cases to purchase, I even have friends scoping them out and buying whatever is available! I don’t think it helps living in the wine country of the SF Bay Area, the wine shelves are usually very crowded for unique wines like Inferno. Although, I do have half a dozen cases but I’m getting nervous that my supply might be getting low! I LOVE this wine and It may seem forbidden, but a whiskey stone or two makes the wine slightly chilled and perfect for consumption. You never know when a wine will go out of favor, so smart idea to stock up. Especially if it’s a wine you love. I finally open the 2016 bottle my step-son Gabe me for Christmas and am absolutely delighted with this wine. I got more of the spice than I did Bourbon. I would definitely buy this again, and found your review while googling to see where I might pick up another bottle. Love it! Thanks for checking out my review Liz! And for sharing your opinion… Cheeers!